Famed shopping spots, contemporary buildings, and numerous amusement parks are few of the many reasons that make Shenzhen one of the most popular tourist destinations in China. Located in Southeastern China, Shenzhen is a major city linking the special administrative region of Hong Kong to China’s mainland. An International finance center, Shenzhen houses some of the most modern towers in the world. Although the major portion of the city is primarily industrial, Shenzhen offers many points of interest for the tourists to savor. Choose from a wide array of Flights Deals to Shenzhen with Lookupfare. Check out some of the most exciting range of offers and grab the best cheap flights to Shenzhen. Also, find many attractive offers on last minute flights to Shenzhen. Located in Guangdong Province of China, Shenzhen is a modern metropolis city. Granted with a sub-provincial administrative status, it is located to the immediate north of the special administrative region of Hong Kong. Being a sub-province, Shenzhen holds powers a little less than that of a province. Prior to being promoted with a city status in 1979, Shenzhen used to be a small market town with a population of just about 30,000 residents located on the route of Kowloon–Canton Railway. In 1980, Shenzhen became the first city in China to be designated with a status of Special Economic Zone (SEZ). Today, the city boasts of a population of approximately 10.8 million people with its metropolitan area’s population exceeding 18 million. Shenzhen use to be amongst the fastest developing cities in the world in the 90s and 2000s. The city’s population boom got a check by less than one percent in a year by 2013 as the growth of the manufacturing industry declined in favor of the other industries. The vibrant and diverse economy of Shenzhen is what led to rapid foreign investment since the city began operating according to the policy of “reform and opening” establishment of the Special Economic Zones in late 1979. Shenzhen is home to headquarters of many multi-national companies as well as the Shenzhen Stock Exchange. A prominent financial center of southern China, Shenzhen was placed 19th in the list of Global Financial Centers Index in the year 2016. The city also houses one of the busiest container ports across the globe. 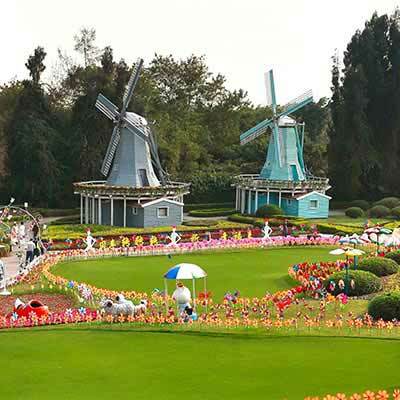 Window of the World – Located at the Overseas Chinese Town, Window of the World is an amazing Replica Park showcasing about 130 miniature replicas of the different wonders of the world, famous scenic spots, and historical heritages. Some of the most popular replicas include Mahamuni Pagoda of Mandalay, Angkor Wat of Cambodia, the Tower of London, the Roman Colosseum, the Leaning Tower of Pisa, the canals of Venice, the Eiffel Tower, the Pyramids & the Sphinx, Ancient Athens, Sydney Opera House, Grand Canyon, Niagra Falls and many more. A visit to this fantastic park is certainly the best way to compliment your flight booking to Shenzhen. Splendid China – Located on the bank of the beautiful Shenzhen Bay, Splendid China is an affluent, vibrant and comprehensive miniature scenery park which vividly showcases the culture, history, art & folk customs and ancient architecture of the ethnic groups of China. Spanning across an area of 30 hectares, the park is divided into two parts – Scenic Spot Area and Comprehensive Service Area. In the former, more than 100 Chinese tourist attractions are available for public viewings which have been miniaturized in a ratio of 1:15. At the park, the visitors can find many features to enjoy such as the Terracotta Warriors, the Zhaozhou Bridge, the Ancient-Star Observatory, the Palace Museum, the Leshan Buddha Statue, Dunhuang Mogao Grottoes and the Stone Forest. Overseas China Town – Stretching across an area of about 9 square kilometers, Overseas China Town is the first National Eco-Tourism Demonstration Zone in China built by the Overseas China Town Group. The project has been jointly awarded by the Ministry of Environment Protection and National Tourism Administration. Based on the theme of harmonious relationship of the mortals with Mother Nature, the area comprises of two ecological theme parks, four resort hotels, three scenic towns, two mountain golf courses, and a Buddhist theme park alongside a variety of performing arts attractions. There are also many dance programs hosted every day at the resort. The most popular ones are Heavenly Zen, a dance performance that uncovers the Chinese Tea Culture and a live-action stunt show called the Roaring Flood. Shenzhen Happy Valley – Located in the local district of Nanshan, Happy Valley is a modern theme park offering numerous recreational activities to the visitors. The activities cover the areas of land, sea and air which differ in day and night. The Valley is divided into 9 theme areas – Spanish Plaza, Adventure Mountain, Gold Mine Town, Cartoon City, Happy Time, Shangri-La-Forest, Sunshine Coast, Hurricane Bay, Happy Train and Maya Water Park. There are over hundreds of items here for visitors of all ages. Many of such items are imported from Germany, Netherlands, and USA. Backed by modern high technology, the entire park is based on the theme concept of leisure. Fairy Lake Botanical Garden – Located in the eastern suburbs of the city, Fairy Lake Botanical Garden is a very popular scenic spot boasting of more than 3,000 species of flora. Apart from being a tourist spot, the garden also focuses on scientific research and spreading interest in science. Spread across an area of more than 52,000 acres, the garden is divided into six different sections – Earthly Paradise, Forest Fossil, Temple Spot, Lake Spot, Desert Spot and ‘Pine, Cypresses, Azaleas’ respectively. Many landscapes have also been built on these spots such as mazes, caves, a pavilion, a pond and a museum featuring exhibits and artifacts of extinct species of flora and fauna. Find the best low-cost flights to Shenzhen with Lookupfare. We make sure that not only you fly at the best prices but also with the most popular airlines with the best of the in-flight amenities and services.